The Vancouver Condo Buzz » Best Value > From $159,900 at The Elliot Street New Westminster Condo High-Rise by Censorio Group > Cheap New West Elliot Condos for Sale! Best Value > From $159,900 at The Elliot Street New Westminster Condo High-Rise by Censorio Group > Cheap New West Elliot Condos for Sale! SPECIAL PROMO > Live mortgage free for 24 months! Elliot Street New Westminster Condos! Brought to you by Censorio Group Developers, this project is garnering a lot of presales attention with the official launch coming October 2012 (right now!). The New Westminster Elliot Street Condos is a new project that is in preconstruction and is located centrally at Agnes Street and Elliot Street New Westminster real estate market. According to some online sources, the Elliot Street Condos in New Westminster will offer only 130 opportunities to homebuyers and investors, which makes this an exclusive development! The team at Censorio Group Developers is comprised of a family of individuals who are committed to creating thoughtful and unique homes. The Elliot Street New Westminster condos for sale is one such project. They keep everything in house from envisioning the projects and design to interior design, construction as well as marketing. You can view more about the Censorio development teams’ philosophy and process below in the Vimeo video. 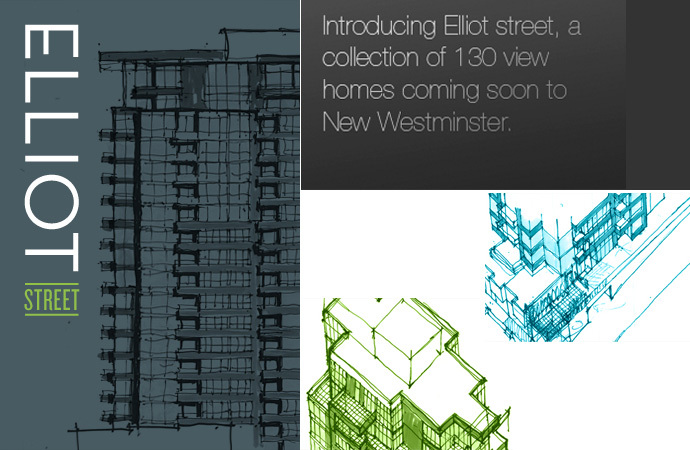 Introducing Elliot Street, a collection of 130 view homes coming soon to the New Westminster real estate market. REDEFINE HOW YOU LIVE. For more information, please refer to www.censorio.com for all the presales details. From the Email Desk at Elliot Street New West condo development by Censorio Group Developers > Thank you for your interest in Elliot Street New Westminster real estate’s newest condo hi-rise with gorgeous interiors and breathtaking views from every suite. A 6-minute walk from the SkyTrain, Elliot Street New Westminster condos for sale is nestled in a quiet neighbourhood, giving you that feeling of being away, while still being close to all the amenities you need. The Elliot Street Condo VIP Realtor Event is coming soon on October 2nd at the Elliot Street Condo Presentation Centre which will be opening to the public at 336 Columbia Street New Westminster BC. Representing the most affordable New Westminster concrete condo value, Elliot Street Condos is a must-see event for any homebuyer. If you are interested in owning a New Westminster condo from just $159,900, contact your realtor today or the sales team or fill out the online form above and we can forward you to an unbiased agent! The Censorio Group development team is now offering the newest condominium high-rise coming to downtown New Westminster real estate market in Fall 2012. NEW WESTMINSTER ELLIOT STREET CONDO HOMES START FROM $159,900! Elliot Street: A fresh understanding of modern life from Censorio Group on Vimeo. ELLIOT STREET NEW WESTMINSTER IS COMING SOON! Elliot Street: Redefine how you live from Censorio Group on Vimeo. Elliot Street offers a fully-integrated European appliance package for the epicurean gourmet and sweeping views from every suite. With presale New Westminster Elliot Street condo homes starting from just $159,900* and 2 beds from $319,900* you can own a home at Elliot Street. Elliot Street: Spaces that transform the way you experience daily life from Censorio Group on Vimeo. Located in the heart of New Westminster Elliot Condos features breathtaking views with award-winning architecture by GBL and beautiful interiors by i3 design. In addition, the preconstruction New Westminster Elliot Condos for sale is only a 5-minute walk from the SkyTrain Station. Elliot New Westminster condo tower is also nestled in a quiet yet vibrant neighbourhood, giving you that feeling of being away, while still being close to all the neighbourhood amenities and services you need. Elliot New West condo tower provides easy access to Downtown Vancouver which is only 26 minutes away for a total of 31 minutes from your front door! In addition, take the SkyTrain from The Elliot New West condos to Metrotown in less than 12 minutes or the SFU Burnaby Campus in less than 8 minutes! Within a close walk or drive away from the centrally located pre-construction New West Elliot condo tower is Albert Crescent Park as well as Douglas College. Community and neighbourhood services such as banks, groceries, shopping and dining are all within walking distance. In addition, almost all of the preconstruction New West Elliot Condos will provide great views, including some with water views of the mighty Fraser River! Some of the interior features for these condominium residences by Censorio Group developers includes maximized views through oversized windows in addition to concrete construction that is backed by the new home warranty by Travelers. In addition, the New Westminster Elliot Condos for sale will feature integrated appliance package which are standard in every home sold here. Also, there is a design driven process by Censorio Group who has put lots of attention and detailing into the construction and design of the building as well as the interiors of the homes. Stay tuned for more information as it is released. The other project currently for sale by Censorio Group is Altezza Burnaby Heights condos.